Miss Manga™? A Sure Sign That Asian Pop Culture Is Part Of World Pop Culture Now! A few days ago I got an excited quick email from none other than Stu-senpai. "Wow, saw this at Walgreens!" Attached were two photos of a new L'Oreal cosmetic product: Miss Manga™ mascara, on display at the store. As many of us might agree, there's a certain thrill to walking past an attractive person. Maybe it's the doki-doki when they glance at you, or the surge of adrenaline you get when you think about striking up a conversation. TOKYOPOP Fam: It's Memorial Day weekend in the United States, which means not only barbecue with friends and family but remembering the million+ veterans who sacrificed their lives throughout history, defending America's freedom. In a very Tarantino-esque anti-typecast, the live-action Bakuman trailer was released this week and the casting decisions are not what audiences would expect. We’ve received some interesting reports from our friends at RocketNews24 this past month regarding some incredible economic opportunities for young people in Japan. As many of you may know, Japan is a rapidly aging society. According to TIME, Japan has had the lowest birth rate on record, four years in a row. Yum or Yuck? Depends On What Side of the Pacific You’re From! Americans assume that their taste in food is universal, considering that American cuisine is a hodge-podge of cuisines from all over the world. However, they would be sadly mistaken. When one considers that, at least where processed food is concerned, adding lots of salt, fat and sugar is an almost universal go-to strategy. It’s tempting for North American palates, but when Asians try American foods, they often consider our foods overkill. Otaku no Video: Shirobako’s honored ancestor to get a new life on Blu-Ray? Shirobako just recently wrapped. I’m actually catching up on it through Crunchyroll now, and enjoying it immensely. The series is set in the world of Anime production. Never mind that the anime industry is kind of a grim place unless you are a key creative or an executive: Shirobako character Erika Yano is based on a real person director Tsutomo Mizushima knew, and she’s no longer in the business because it’s just a brutal slog for scary low wages. Heisei Samurai vs Ebi Furai Fastball! The real-life fruit ninja is back! 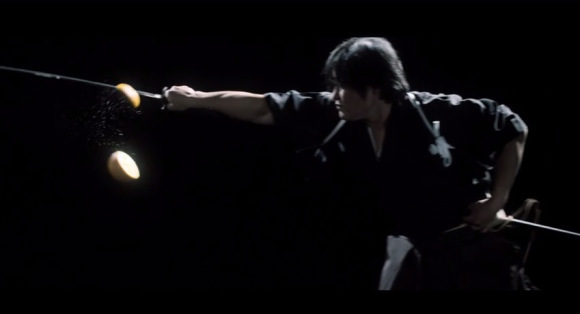 Isao Machii, the Iaijustu practitioner fondly known as ‘Heisei Samurai,’ or ‘Modern Samurai,’ holds five Guiness World Records for his incredible swordsman feats. He’s putting those skills on display for the world once again in a new SoftBank commercial, which features Isai Machii slicing various objects shot out of a fastball machine at speeds up to 93 miles per hour (150 kph), including a delicious looking fried shrimp! The Heisei Samurai slices and dices the ebi as it travels through the air at an incredible 80 miles per hour (130 kph)! In the commercial, he also cuts through an orange flying at 50mph (80 kph), and a glowing red orb launched at a screaming 93 miles per hour (150 kph)! That’s one fast sword arm. Isao Machii is an Iaijutsu proponent who resides in Kawanishi, Hyogo. In 2005, he created the Shushin-ryu Iaijutsu style. He teaches Iaijutsu at the “Shushin-kan” Iaido training venue and devotes himself to his studies every day with the aim of restoring the traditions of Muso Jikiden Eishin-ryu. His Guinnes World Records include: “Most sword cuts to straw mats in three minutes,” “Fastest 1,000 martial arts (iaido) sword cuts,” “Fastest tennis ball cut by sword,” “Fastest BB pellet cut by sword,” and “Most martial arts sword cuts to one mat (Suegiri).” We imagine “Fastest Fried Shrimp cut by sword” will soon be added to that list. Hosoda’s ‘The Boy And The Beast’ Gets Theatrical Release In U.S.